This storybook tells the life story of Siddhartha from birth to enlightenment. Quelle Histoire has been developing apps to help kids learn about world history. In the past few months, we have reviewed the story of Cleopatra, the biography of John Paul II, and even the history behind Normandy Invasion in D-Day. Offered in a set of interactive chapters, each storybook changes the way kids learn about history. 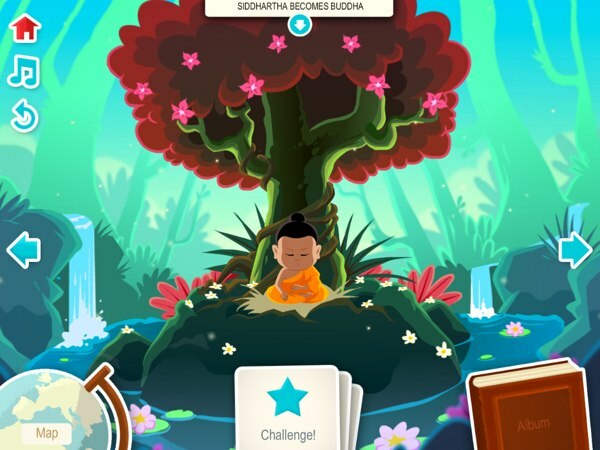 Today, I’d like to highlight the latest app in this series, called Buddha for Kids. As the title suggests, this storybook tells the story of Siddhartha from birth to his legacy today. Siddhartha was born in the village of Lumbini, Nepal. He was born as a prince — the heir to Suddhodana, king of Kosala. He lived in a palace at the foot of the Himalayan mountains where he took lessons on science, literature, and foreign languages. He also learned about Hinduism, music, and dance during his time at the palace. When Siddhartha was 16 years old, he married a princess named Yasodhara. They had a boy named Rahula. But not long afterwards, Siddhartha was bored with his royal life and left everything behind to go on a journey to find happiness. Along the way, Siddhartha met a hermit who taught him about living in solitude, a sage who taught him a new way of living, and a Brahmana who explained to him many of the complicated things in life. Siddhartha decided to cut his hair and sent back his servant. When he arrived in the city of Gaya, he decided to go inside a cave and meditate for six years. But it was not until he meditated in a lotus position under a huge fig tree in the village of Uruvela did he awaken filled with joy. That was when he became Buddha, also known as The Awakened One. Ever since that day, Siddhartha had a new goal in his life: for humans to become better and understand what is essential in life. His first speech in Sarnath became the founding text of Buddhism. He gained more and more followers, and even his rivals became his disciples. He ended his life as an 80-year-old in Kushinagara, but his teachings spread throughout India, most of Asia, and even the West. 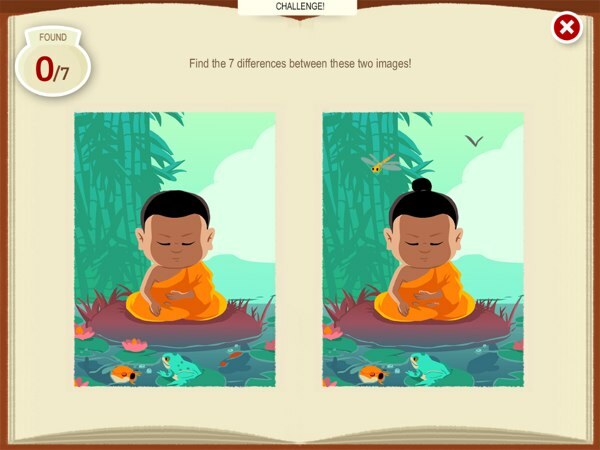 Buddha for Kids is suitable for early readers ages seven and up. But I’d suggest you accompany them as they read because they’re bound to ask many questions related to Siddhartha’s life. The storybook is available in 11 different languages, including Russian, Portuguese, and Korean. Quelle Histoire works with researchers from MoDyCo, a lab from CNRS (France’s national scientific research centre) specialized in the science of suitable language for young audiences. The text in the app were originally written in French by Patricia Crété, editor in chief of the Historia magazine, and then translated into different languages. Each time you complete a challenge, you can collect stickers with facts on them. Similar to other Quelle Histoire storybook apps, kids will find contextual maps, challenges, and portraits in Buddha for Kids. Alongside the themed mini games, they contribute to an immersive reading experience. In total, there are 30 focus cards and portraits that you can collect in this app. Some challenges are designed to take advantage the information you get from the portraits that you have collected. If you pay attention to the information and manage to pass the challenge in a breeze, you’ll really feel rewarded. My suggested flow for reading this book is to read a chapter, complete the challenge, and read all the facts inside the portraits before moving onto the next chapter. The app includes 10 mini-games with popular mechanics, such as spot-the-difference. Buddha for Kids is a simple biography about the life of Siddhartha that you can read along with your kids. Even though kids ages 7+ can read the story independently, they might need your help to understand what Siddhartha was trying to do and the context in which he was living at that time. I learned a lot from this book, and I’m pretty sure most readers would too.